It's that time of the week and I painted my nails yesterday. 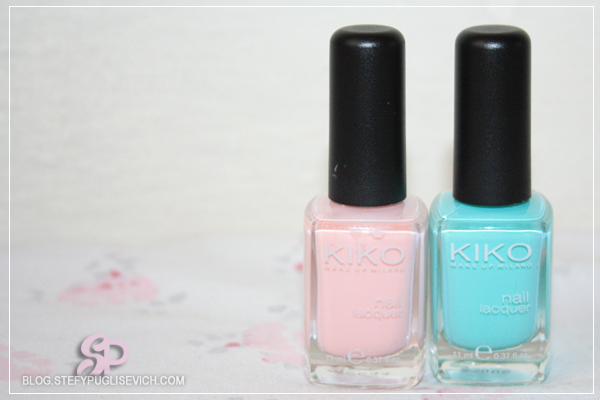 I wanted to experiment with a new brand called KIKO. Have you ever heard of it? It is an italian brand that is widely found in malls all across italy and sicily and from what i have managed to find out there is even stores in the UK, Spain and some other countries across Europe. The consistency depends on the colour in honest truth. I for one am looking at these photos and saying this gorgeous mint green just doesn't look the same as on these pictures it looks more blue then green. MINT MILK (389) it is actually a must have for this summer ladies and gents, one coat and you are done with this colour. The pigmentation was flawless and for the price of just € 2 . 50 It's a bargain. It's very rich in colour and very creamy like. Only needed one coat and a topcoat. Satin Pastel Pink (216) on the other hand is a sheer toned polish, as it needed two coats for the best pigmentation and for the sparkles to show up more true to colour. I love how it goes into the coral side of pinks too. Lovely! Did you buy Kiko cosmetics online?